In this episode, Max Keiser and Stacy Herbert argue over whether things are looking better or worse for the American worker. While Stacy argues that the return of some manufacturing is a sign that wealth creating jobs may return to the US, Max counters that the system is so corrupt that the chances of labor getting any cut of the wealth is nil and that the Internet giants will prevent the rise of a powerful decentralized economy online. In the second half, Max Keiser talks to Professor Jonathan Feldman about the Global Teach-In and about a boycott and short sale campaign and creating an industrial policy for America because right now the US even outsources some military production to China. Keiser Report: Banker Infestation (E386) In this episode, Max Keiser and Stacy Herbert argue over whether things are looking better or worse for the American worker. Keiser Report Ho Ho Freaking Ho E384 Ft. John Cooper Clarke. 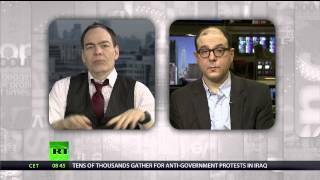 Video Link : ... Keiser Report Banker Infestation E386 Video Clip. Watch Keiser report hang a banker a week e252 film streaming (2014).